Senior ANC leaders are engaged in urgent secret talks to negotiate an exit for President Jacob Zuma, possibly as early as next month. Surprisingly, the talks are being driven by close allies of the president who are trying to negotiate a way for Zuma to leave office without him being embarrassed. With Cyril Ramaphosa having been elected ANC president this week, concerns are growing among people close to Zuma that there will be immediate attempts to recall him. Tomorrow Anglican Church Archbishop Thabo Makgoba is expected to exert pressure on Ramaphosa to force Zuma out. Church insiders say Makgoba would use his Christmas sermon to call on the national executive committee, backed by the party's MPs, to act "boldly and quickly" to remove Zuma. 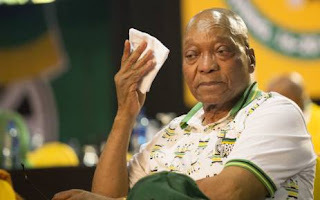 Yesterday Zuma gave his enemies ammunition to call for his head as early as the first NEC meeting next month, when he lodged an appeal against a judgment by the High Court in Pretoria that ordered him to establish a commission of inquiry into state capture. The 11-page appeal cites about 20 grounds on which Zuma will argue against rulings that he should personally pay costs and that he must institute the judicial commission, among others. Zuma's appeal is in defiance of a resolution of the ANC conference that instructed him to set up the inquiry "expeditiously". Ramaphosa's backers are expected to argue that Zuma's appeal is proof that the two centres of power - with Zuma calling the shots at the Union Buildings and Ramaphosa at Luthuli House - will not work and that Zuma will have to vacate office. Ramaphosa's camp holds a slim majority in the newly elected NEC and there is anticipation that it might raise the issue as soon as the first NEC meeting ahead of the party'sJanuary 8 anniversary celebrations in East London, scheduled for January 13. One of the people involved in the talks is new secretary-general Ace Magashule. Police Minister and NEC member Fikile Mbalula has also made contact with several senior ANC leaders, including those close to Ramaphosa, asking them to help negotiate a deal. The Sunday Times has learnt that secret meetings are planned after Christmas to discuss ways to manage Zuma's exit. While Zuma's supporters want an amicable exit, it is difficult to negotiate any form of amnesty deal under South African law that would protect Zuma from facing trial. Corruption charges stemming from his relationship with his former financial adviser Schabir Shaik are pending against the president and evidence could surface against him once the judicial commission of inquiry into state capture commences. South African law has no provision for amnesty prior to trial on criminal charges. There would have to be some admission of wrongdoing on Zuma's part, which his supporters know would be difficult to extract.